The president wants Europe to help Ukraine rebuild the region. 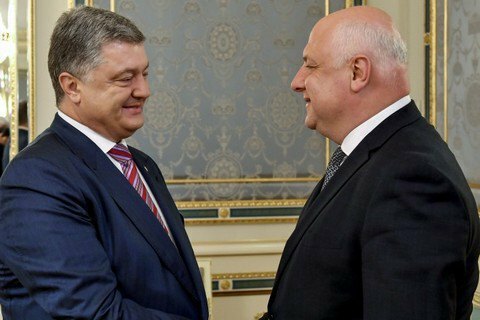 President Petro Poroshenko has come out with an initiative under which every EU member should prepare a targeted programme of patronage over certain towns of Ukrainian Donbass to help them revive and restore their infrastructure. According to his Facebook post, he announced this idea during a meeting with OSCE Parliamentary Assembly President Georg Tsereteli upon the latter's return from a visit to eastern Ukraine. They also discussed ways of counteracting Russian aggression, including the initiative to deploy a UN peacekeeping mission in Donbas. They agreed that sanctions against Russia should be kept and that it is necessary to continue efforts to secure a release of Ukrainian political prisoners and hostages from Russian prisons. Last year, the Ministry for Temporarily Occupied Territories and Internally Displaced Persons launched a portal for projects to restore Donbas. Local governments will be able to post their needs on the website so that donors could see where to direct their assistance. The local authorities will then report on the use of funds there.